Privacy Has Never Been Possible Without Security. Today, You Can’t Have Either Without Automation. We are living in a digital, mobile world. Business runs on data, at a speed too fast for manual, paper-based processes to keep up. If your data privacy program isn’t fully digital, automated, and connected, it will fail—costing you money, customers, and maybe even your business. For privacy and compliance professionals, codifying your data security and privacy processes isn’t enough. You also need to operationalize those processes and prove that you, your employees, and your partners are complying with them. 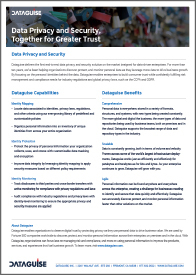 For both documenting and operationalizing your data security and privacy processes in a seamless, automated way, Dataguise has got you covered, end-to-end. Build a consolidated inventory of identities with associated privacy requirements per regulations, contracts, notices, and individual choices. Discover all personal data across the enterprise. De-identify personal data for various business use cases. Encrypt personal data for highly restricted or controlled access. 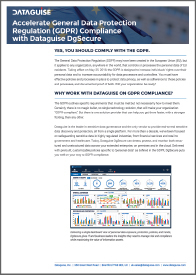 Monitor personal data for compliance violations and faster breach detection. Log cross-border transfers of personal data. Track third-party disclosures of personal data. Notify of retention limits to uncover opportunities to delete or archive personal data.